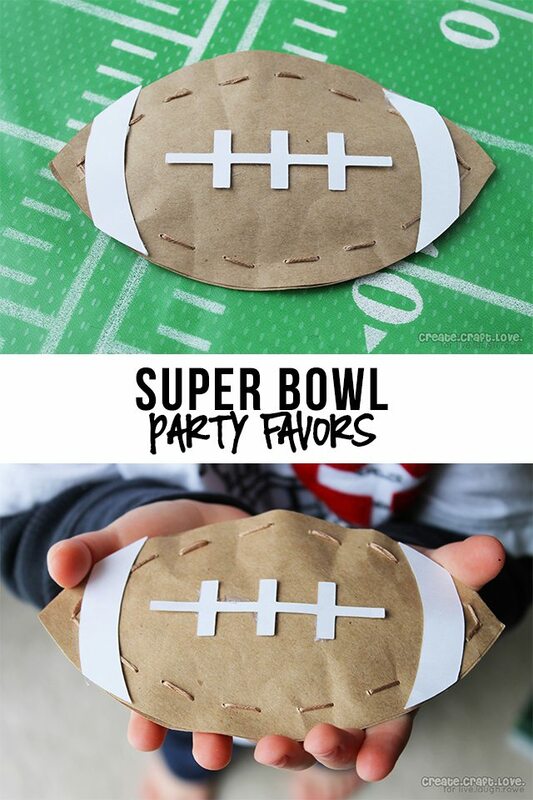 Super Bowl Party Favors that are sure to score a TOUCHDOWN! Hi again, Live.Laugh.Rowe readers! Jill here from Create.Craft.Love. I hope everyone had a wonderful holiday season and that you were able to spend it with friends and family. It always feels like kind of a let down once the hustle and bustle of December is over. Fear not! There are tons more great events coming up! We are a sports household so we are really looking forward to Superbowl Sunday! 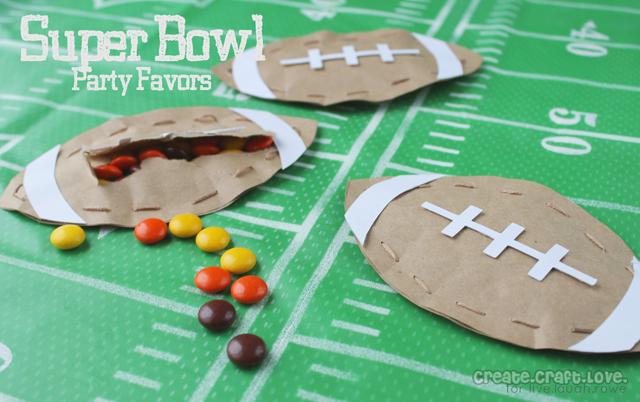 Today, I am sharing my candy filled Super Bowl Party Favors! These are bound to be a hit with kids and adults alike! Who wants to learn how to make your own Superbowl Party Favors — and score a touchdown with your friends? 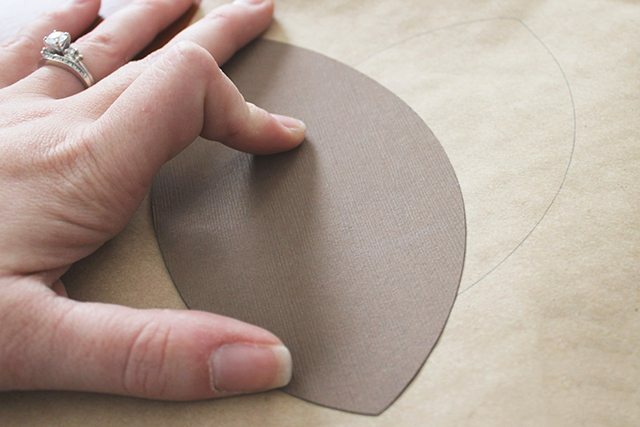 Begin by folding the kraft paper in half. Trace your football image and cut. I do it this way so the footballs are symmetric. Now you have two footballs. Place them on top of each other. 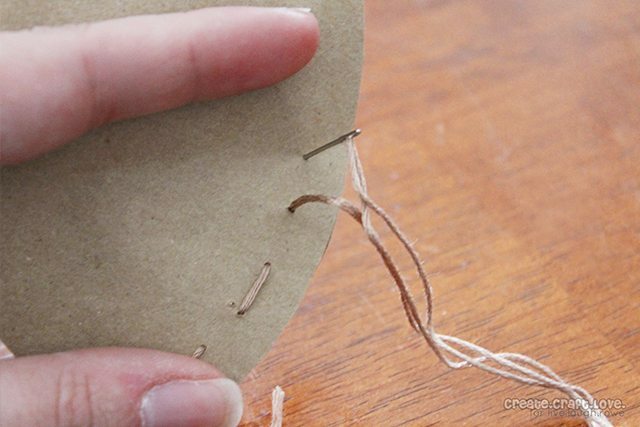 Thread your needle with the embroidery floss (#841 is the color that most closely matches the kraft paper). Next start stitching up your football. I used a simple hand stitch. Be sure to leave a small opening at the top so you can fill with candy. Once you sew up to the small opening, fill your football with candy. I chose Reese’s Pieces because they looked more manly. Haha! Stitch the football up and tie off to secure. Trim the excess embroidery floss. I cut out some stripes and stitching on my Cameo for decorating the football pouches. If you don’t have a Cameo, use a white paint pen and draw them on! I hot glued my stripes and stitches in place. A glue stick did NOT hold. Aren’t they cute and festive? To open, simply poke your finger through the top of the football and ENJOY! You can also find me on Facebook, Twitter, and Pinterest! Oh my goodness…these are too cute! What a fabulous idea! SO CUTE! I know my kids will love them! Very fun idea – a great way to get the kids excited to help with game day prep! These are soooo cute, love them! Where did you find (or how did you make) the football field tablecloth shown in these pictures? I need something JUST like it but have been going crazy trying to find one! I found it at Party City! Unfortunately, it does have NFL logos all over it. But if you are ok with it, then it would work great! THANK YOU! I need this for a project I’m doing tonight and was about to resign myself to making my own version out of felt!